I’ve been syncing my calendars for years. If you’re interested in why I am using Google, then read the history section, otherwise skip down to the how to section of this post. For past six years or so, I’ve been using Plaxo to synchronize my calendar and contacts between my work computer and my home computer. My work computers have been Windows XP/Vista/7 with Outlook 2003/2007/2010, so I used the Plaxo Outlook Toolbar to sync calendars and contacts. At home, our main family computer has been Mac G3/G4/Mini running OSX, which sync’d to iCal and the Address Book. I also had a non work Windows Mobile phone that I would sync through a cradle with the Mac. This solution worked well for several years. My wife could see what my work schedule was from the Mac, I could see her and the kids’ schedule using Outlook, and it was all on my phone. There were a few hiccups over the years, duplicates would get created somehow when I would add/remove a machine to the mix, but those were manageable. Of course, the best part was the fact that it was free. At some point, I knew this free service would go away. Last year, it finally happened. Plaxo would move the Outlook toolbar from free to their Premium (paid) service. Really, it makes sense. Most Outlook users are business users. Surely these people would be willing to pay for a Premium service. I was one of them for the past year. I paid for a year’s subscription, at a sharp introductory discount ($47). I was extremely busy at work and didn’t want to investigate other solutions to my syncing problem, so I paid for a year. Well, a year later, some things have changed. Outlook 2010 was released and being a geek who makes a living working with Microsoft products, I started using Outlook 2010 while it was still in beta. It installed fine, but I got a rather rude surprise when I found out that the Plaxo toolbar didn’t work with 2010 (32 or 64 bit). SO, as a quick fix, I spun up a spare Virtual Machine (on my Hyper-V server), installed Outlook 2007 w/Plaxo and let it run. It’s sole purpose was syncing while I waited for Plaxo to release a 2010 toolbar. The next thing to change was my cell phone. I got a cool HTC phone with a data plan. No longer would I need to cradle my phone with a machine, instead it sync's over the air. The other change was the price. When I noticed that my Outlook toolbar was no longer working (I don’t think I got a notice), I found that the price would be $59. Although it’s not that much more, it had crossed a line. (Plaxo should listen up to this:) I would gladly pay $20 annually for the convenience and I wouldn’t have thought much about it, almost an impulse buy. At $60, it is now worth my time to study alternatives. Turns out, I can now use Google’s calendar service as my hub for syncing my calendars. SO, I’ve now replaced a Premium Plaxo service with a free Google service. The first thing I did was install the Google Calendar Sync utility. It connected my primary calendar in Outlook with my Google calendar. 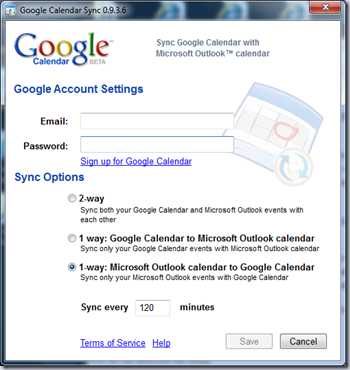 I set it to do a one way push of events from Outlook to Google, but it does allow two way syncing. That takes care of getting my work calendar to Google. (BTW, this calendar is hosted on my work Exchange server.) Next step is publish my family calendar from the Mac to Google. Google has the step by step instructions here. I added my work calendar from Google, as well as the separate family calendar. One issue I did have was that the calendar events already in iCal didn’t appear to be uploading, so I exported that calendar and used Google Calendar’s web interface to upload the events. At this point, my work calendar is now on Google and on the Mac, while the family calendar was on the Mac and on Google. The last step was to get the family calendar on my Outlook. For this step, I decided to just use Outlook’s internet calendar function. You start by going to Google Calendar, into the settings, and getting the “ical” URL for the particular calendar you want. I then entered that URL into Outlook (Go to calendars in Outlook, and switch to the “Folder” tab – then select Open Calendar –> From Internet). My family calendar then appeared in Outlook.